I just returned from a 10-day trip. My husband had a conference so we decided to make a family trip out of it and see some relatives in LA first, since some of the hotel costs and his plane ticket were paid for by his work. Now that I’m home I’ll be back to blogging again! I have traveled a lot in the past 10 years. We lived in Germany for three years right after my oldest child was born. We made the most of seeing Europe and racked up Preferred status from flying home to see family. (But really, even if I could have flown First Class it’s just not the same with a toddler). In the process I developed ways to make travel easier with kids! I personally wished that every hotel room would come with a shelf about 4 feet high off the ground the whole way around the room, with hooks underneath to hang things. That way my kids couldn’t reach anything I didn’t want them to. Additionally, I always had to hide the TV remote and unplug the phone from the wall or else I’d end up with a huge long-distance bill upon checkout! And when buckling a child’s car seat in an airplane, turn the buckle UPSIDE DOWN so you can release it by opening it away from the back of the seat instead of toward the seat, where there is no wiggle room. Those were good times, and some of my travel habits have stuck with me even though my kids are a little older. It has pockets for all kinds of toiletry items like your toothbrush, toothpaste, shampoo, razor, even jewelry. I DO ziplock my shampoo and other liquids within this organizer just to make sure they don’t leak, though. Just like I am a fan of using hooks on the walls at home, when I travel I like to hang things in the bathroom so the counter doesn’t get all cluttered up. This would also make a great organizer for Hair Bows and Accessories at home since you could hang it in the closet with all the dresses! I saw some available at TJ Maxx last week for about $10, but you may be able to find them at drug stores in the make up aisle, and Vera Bradley makes a version too. What Travel tip can YOU share? I’d love to hear from you! 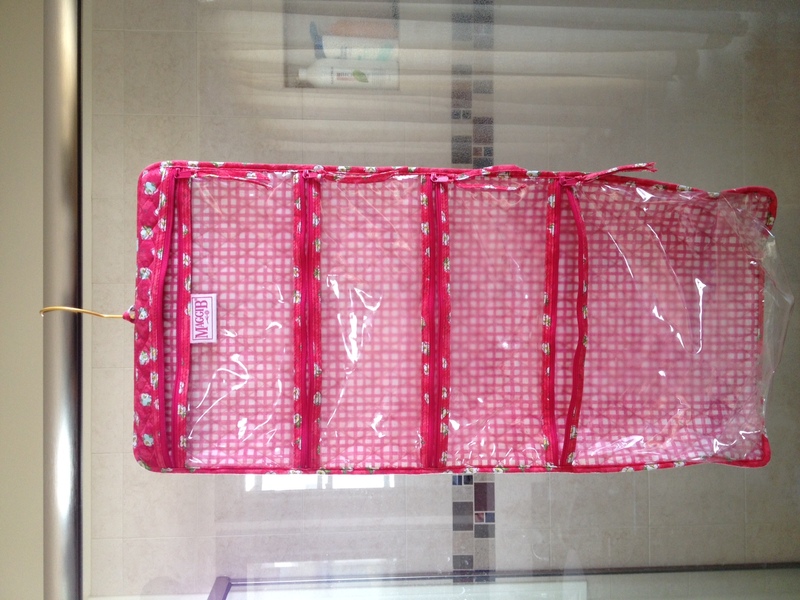 This entry was posted in Bathrooms, Quick Tips, Travel and tagged hooks, organize, pockets, tools, travel organizer, Vera Bradley by organizedohana. Bookmark the permalink. Carry make-up (limited selection, but basics) in your carry-on in case of delays, including overnight. Same with contact lenses / supplies. Anything else the hotel can supply. Let’s see… over the 8 months of traveling as a family we’ve learned a lot. Wrap duc tape around and around a pencil so that you don’t have to bring the whole roll because it’s always handy to have. Ibuprofen should go into the wallet. Don’t carry a lot of clothes period. Even if you think you’ll really really need it, you don’t. Room in your bag makes the entire rolling/folding/flat thing a whole lot easier. Have all of the liquids (like contact solution) in a plastic bag ready to go so that you aren’t riffling through your backpack in front of the security and the long line of grumbling people. Always have your camera on you. Lot’s more but that’s all I can rattle off of the top of my head for you! I am a big fan of organizing – thanks for writing about all of your ideas!